Trioliet was founded in 1950 by 3 (Trio) Liet brothers. Located at Oldenzaal in Holland, it remains in the family to this day. With over 65 years experience in the design and manufacture of feeding machines, they really are at the top of their game. They now supply dairy and beef feeding technology to over 50 countries worldwide. As a European Manufacturer Trioliet obviously place sustainability in very high regard. As a result, you can find many innovations throughout the range that earn their Green Label status. Common throughout the UK, top loaders are the bread and butter of the diet feeder range. The Solomix feed wagon is available in a range of volumes from 8 to 52 cubic meters. This trailed machine boasts various options in both size and discharge method to ensure there’s a machine to suit every operation. 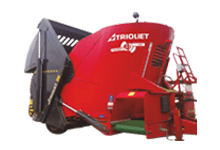 In fact, if you combine this versatility with innovations like the trioform knives, special welded twin stream augers and a unique maintenance free auger bearing construction, you will see Trioliet is the diet feeder for you. 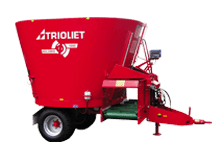 Trioliet self loading feed wagons protect the structure of the silage clamp and reduce the risk of spoiling. A powerful cutting system combined with an independent hydraulic circuit produces a high-pressure cut even with low hp. These versatile self loading diet feeders are available with 1 or 2 augers. Given that the Triomix P1 is also fitted with a straw blower you will certainly get maximum machine usage for your money. As dairy farming practices change there is a trend towards larger herds. These larger concerns obviously place further demands on our time and machinery. 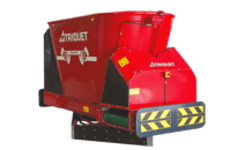 A self propelled diet feeder offers you a dedicated and economical solution. 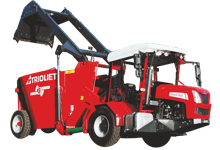 Trioliet offer the Smartrac range with a 10-12m cube capacity. These models are rear loading with a front feeding conveyor. They also have 3 different cutting options available. If you are looking for something bigger, the Triotrac should fit the bill. It has a cubic capacity from 17-24m and an ergonomic front telescopic cutting system. Consequently, this provides a platform for comfortable all day usage and exceptionally high performance and output. Automation is gathering popularity and pace in the UK farming industry. Research shows that more frequent feeding results in increased intake and production. In fact, it can also improve the animals health and life expectancy. The Triomatic automatic feeding system provides 24 hour fully automated feeding. You can choose a static mixer which will service either rail suspended or sensor guided robots. These robots then deliver the mixed feed around your facility for you. For even larger operations there are the bunker feed and auto shear options. These systems both combine with mixer robots to provide fully automated feeding on a truly large scale. A single robot alone can provide frequent feeding for up to 600 cows with a minimum of human interaction required. Probably the most advanced system of its kind on the market, the Trioliet Feed Management system really makes a difference. For one thing, this Windows based system is available to use across the Trioliet diet feeder range. Simply enter a few specific details into the system and you’re done. Information is then transferred to the diet feeder which displays everything the operator needs to know. Of course, all information is stored on the system which is capable of producing numerous reports. TFM Tracker offers additional management tools like operator control, pen review, ingredient tracking and online feed data exchange. This system ensures accurate dietary requirements are delivered where they should be and all relevant information is fully tracked. Want to know more? 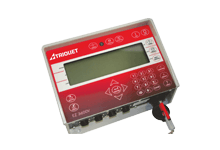 Call us on 01325 378552 or else email enquiries@brmltd.co.uk We can tell you all about our Trioliet equipment.